A wide barrier for the well fancied Ef Troop in Saturday’s $2m Magic Millions 2yo Classic (1200m) at the Gold Coast hasn’t fazed the confidence of premiership winning trainer Tony Gollan. 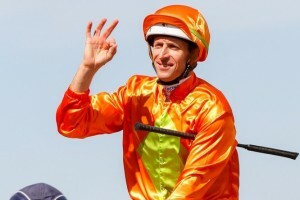 Hugh Bowman, above, rides Jonker in the 2018 Magic Millions 2yo Classic at the Gold Coast. Photo by Sarah Ebbett. Ef Troop is still well in the betting at $4.40 second favourite at Ladbrokes.com.au behind Jonker at $4.20 after drawing barrier eighteen of twenty-one in the original barrier draw at Surfers Paradise this morning. The final field for the Magic Millions 2yo Classic will be reduced to sixteen runners and if none of the five emergencies gain a start, Ef Troop will jump from gate thirteen for Matthew McGillivray. Gollan can see Ef Troop leaving the barriers cleaning before getting into stride and settling in or near the lead. “He won’t be in the barriers for too long drawn out there,” Gollan told AAP. Gollan will also saddle up $21 chance Outback Barbie who fared better at the barrier draw with gate six but is likely to move in one spot at start time. Jim Byrne takes the ride again on Outback Barbie after the pair combined for a debut win in the Listed $100,000 Calaway Gal Stakes (1110m) at Doomben on December 16. Ef Troop is undefeated from two race starts and after winning a 1050m two year old Handicap at Doomben on November 4 went on to kept his winning record intact with an all the way victory in the Listed $100,000 Phelan Ready Stakes (1110m) at Doomben on December 16. The David Atkins trained Jonker with Hugh Bowman booked to ride came up with barrier three while smart filly Sunlight drew out wide at fifteen in the original drew but trainer Tony McEvoy wasn’t very concerned either. Sunlight has led and won at her last two starts at the Gold Coast and McEvoy can see Luke Currie letting the Zoustar filly slide forward and settle just behind the leaders on Saturday.